OK, so after creating new menu entries & desktop shortcuts and after creating new menu sections, let’s see how to create taskbar shortcuts. The “Spacer” plugin is just a way to add a separation between the different plugins. On the screenshot above, you can see that my second spacer is “stretched”, which means that all plugins that comes after it (System Tray + Digital Clock in my case) will end up on the right side. 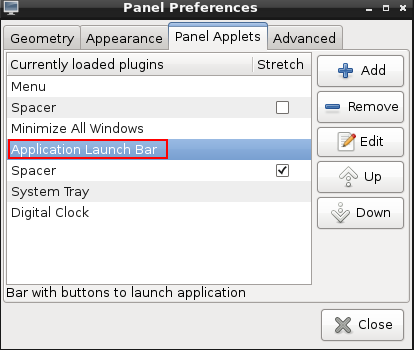 Now select it, click on the “Edit button”: this will display the launch bar configuration dialog. The right side of the dialog displays the applications that are part of your start menu: simply add the ones that you want to the left side of the dialog. Now if I double-click on the text.txt file, abiword (the first item highlighted in the screenshot above) is going to be launched. 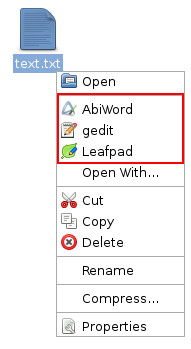 Where does this “AbiWord – gedit- Leafpad” list come from ? 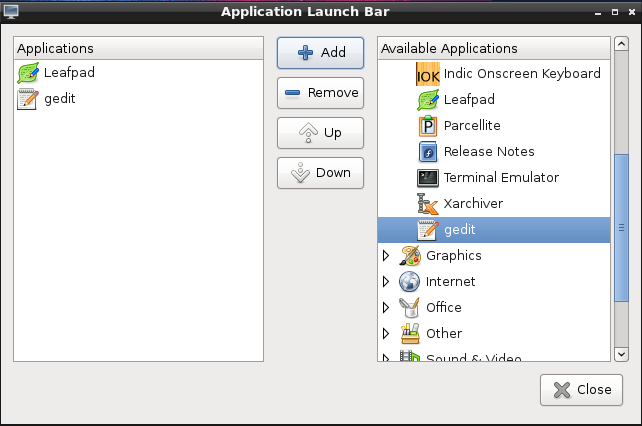 I want to use gedit instead of AbiWord when double-clicking on the file: how can I change this ? 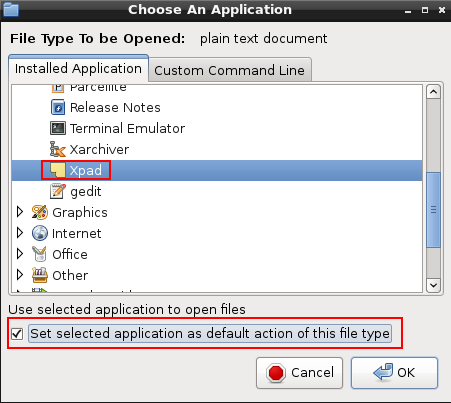 I want my text file to be opened by a program that is not listed: how can I do this ? Sit back and relax, I’m going to tell you the whole story. 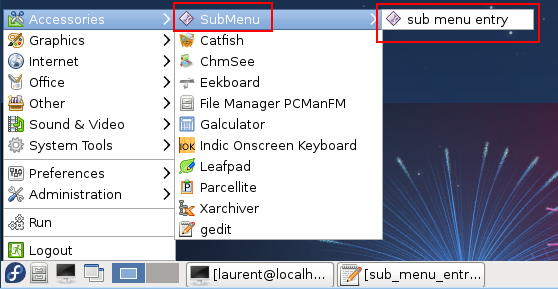 These files are mainly used to specify which elements are going to be displayed in the LXDE start menu and on your desktop. 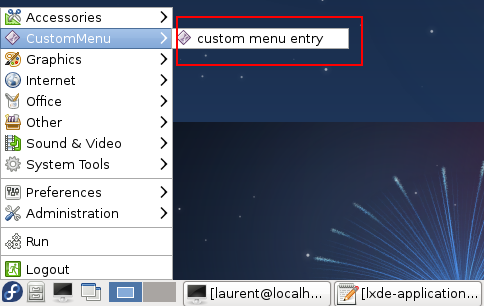 Check my creating LXDE shortcuts post for more information. This file is located in /usr/share/applications/mimeinfo.cache and it is a basically a raw reverse cache for the .desktop information. Check this link for more information. 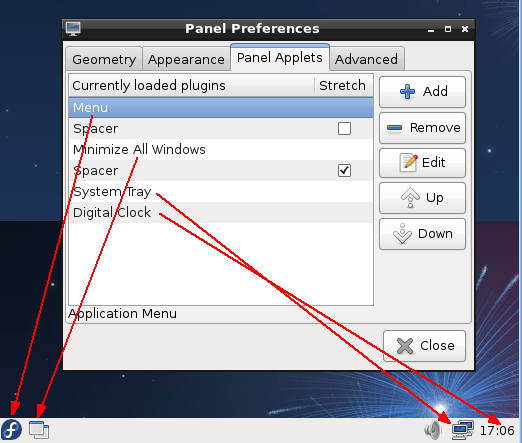 More precisely, each .desktop file on your system (which can be located either in /usr/share/applications, in /usr/local/share/applications or in ~/.local/share/applications) can contain a “MimeType” attribute which states the mimetype that the program associated to the .desktop file can handle. So this translates to “any file with a text/plain mimetype can be opened using either abiword, gedit or leafpad”. 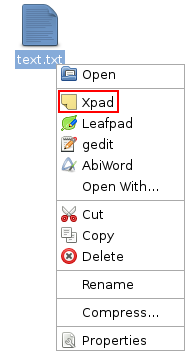 This list (abiword + gedit + leafpad) is exactly the one displayed in PCManFM when I right click on a file (see screenshot above). The first item in this list (in my case: abiword) is the program that is launched when I double-click on a text file in PCManFM. However, editing this mimecache.info file (to change the order of the .desktop files that are associated with the text/plain mimetype) is not what you want to do. The truth is you may lose all your changes after installing/removing a new Linux package. defaults.list is a file where you configure the default program that should be used to open a file. To be very specific, this is where you configure the default “mime type -> .desktop file” association. Like .desktop files, you can have a defaults.list file in any of the following locations (you can even have 3 files: one at each location). First, there is a global defaults.list file located in /usr/share/applications and then you can have one for each user, located in ~/.local/share/applications. As you can guess, the “user-level” file has higher priority than the “global one”. But if I also have a ~/.local/share/applications/default.list file that contains a “text/plain -> fedora-leafpad.desktop” mapping, then double-clicking on a text file in PCManFM will open leafpad (since this file has “higher priority” than the files in the 2 other locations). But wait, there is more ! Yes that’s true, one more file to bother you (did I mention “crazyness” at the beginning of this post ?). Now if you think that ~/.local/share/applications/defaults.list has higher priority than /usr/share/applications/defaults.list which has higher priority than /usr/share/applications/mimeinfo.cache”, you would still be incorrect because ~/.local/share/applications/mimeapps.list has even higher priority than all these bastards. Does this looks familiar ? No, it’s not because I’m not running this as root (as explained here, here and there) : you can see in the command above that I’ve used the sudo command ! It’s (again) because SELinux is preventing the httpd process to listen on port 8082.
if the auditd daemon is running, SELinux denials are in /var/log/audit/audit.log. if the daemon is not running, you’ll find them in /var/log/messages. From there, you can choose to either disable SELinux, use a port that is currently allowed, or add the port you want to use to the list of authorized ports. What is the quickest way to access a Windows Shared Drive from CentOS ? Use smbclient ! 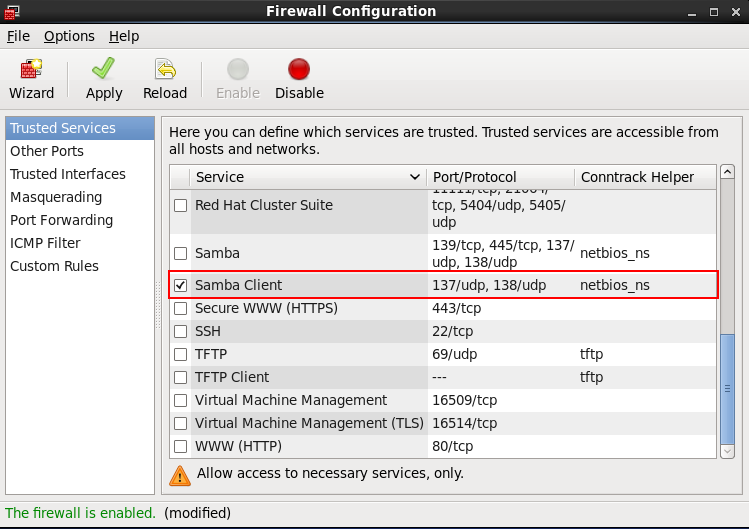 It’s an FTP-like client to access SMB/CIFS resources on a server and its part of the “samba-client” package which is installed by default on CentOS. That’s because the domain name must be provided using the -W option. Also (and I must say that I lost a couple of minutes before of this), the password that you must enter is the one from the domain you want to connect to, not the one from your local Linux account. From there, you can navigate in the target system using the “ls” & “cd” commands and upload/download files using the “put” & “get” commands: see the smbclient man pages for more information.